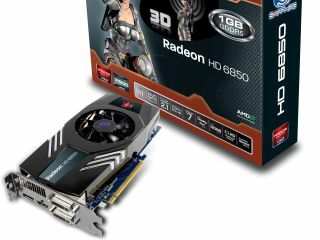 Sapphire has announced its latest AMD graphics cards, with the HD 6850 and 6870 the "first cards using the second generation of DirectX 11 technology." The official arrival of the AMD's new HD 6580 and 6870 cards has triggered a flood of announcements from the major graphics card manufacturers. Sapphire's first offering – the Sapphire HD 6870 – brings a total of 1120 stream processors and 56 texture units, a core clock speed of 900MHz and 1GB of GDDR5 memory. The second card is the Sapphire HD 6850, which offers 960 stream processors and 48 texture processing units and has a lower clock speed of 775MHz. "Like previous generations, the Sapphire HD 6800 series has an on board hardware UVD (Unified Video decoder) – this technology is now in its third generation, considerably reducing CPU load and delivering smooth decoding of Blu-ray and HD DVD content for both VC-1 and H.264 codecs, as well as Mpeg files, and now introducing support for Multiple Video Coding for Blu-Ray 3D, added Sapphire's release. "Dolby TrueHD and DTS-HD Master Audio is supported, and HDMI capability has also been upgraded to HDMI 1.4a." The cards also support AMD's multi-monitor technology EyeFinity. "The HD 6870 has two DVI, one HDMI and two mini-DisplayPort outputs, allowing a wide choice of monitor configurations to be used," adds Sapphire. "The HD 6850 has two DVI, one HDMI and a single DisplayPort output. "With the release of the DisplayPort v1.2 drivers, it will be possible to daisy chain several DisplayPort v1.2 monitors from each DisplayPort output."